Featuring a full QWERTY keyboard for email and text messaging, the Samsung Alias 2 features a unique handset design with a dual hinge - just like the SCH-u740 flip phone it replaces. With a compact, trendsetting clamshell casing and two vibrant color displays, the new Virgin Mobile Wild Card keyboard cell phone by Kyocera takes in all the basics and just about everything else. Include emailing, texting, IMing, gaming, browsing online, or streaming full music tracks, plus camera phone features and you've got an elegantly refined Switch_Back. If you have been tilting towards a keyboard phone and a smartphone in an all-in-one device, the Tilt II mobile phone is an option. It's fully loaded and include a super high-resolution 3MP camera. Offered through Verizon Wireless, the stylish SCH-i760 comes with Windows Mobile 6 and includes Microsoft Word, Excel and PowerPoint applications. "The SCH-i760 is an exciting handset for Samsung because it features a full QWERTY keypad in a horizontal slider," said Peter Skarzynski, senior vice president, Samsung. "This is the next generation in smartphones and features the total business package." The LG enV2 wireless phone is a sleeker version of the Lg enV and comes in black or maroon colors. Multimedia features include V CAST video and V CAST Music, GPS-enabled VZ Navigator, an integrated QWERTY keyboard, Bluetooth, a large screen and a 2.0 megapixel camera. A slider-style phone with a hidden QWERTY keypad, Samsung's SGH-t729 cell phone is also called Blast. T-Mobile's latest keyboard cell phones in the Sidekick-series include Sidekick LX and Sidekick iD, a follow-on to Sidekick III. The newer versions of the popular messaging favorite are proving to be just as popular as their predecessors like the Sidekick II. Kyocera's addition to keyboard cell phones is the Strobe - an upgrade of the Switch_Back Phone marketed by Virgin Mobile. Both phones are popular with teenagers. 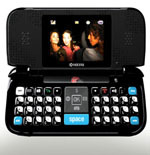 While the Sidekick iD features changeable faceplates, in addition to a QWERTY keypad, it lacks a camera phone. 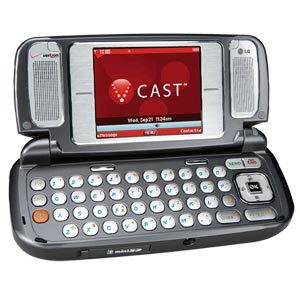 On the other hand, the Sidekick III includes a camera and a built-in MP3 player, and lets users connect by voice, text, IM and e-mail. Key Sidekick III improvements and additions include a slimmer and sleeker design, integrated Bluetooth for hands-free calling, and EDGE support for faster Web browsing. The LG VX9800 cell phone takes the tedium out of mobile browsing with its hidden QWERTY keyboard. Kyocera's addition to keyboard cell phones is the Strobe - an upgrade of the Switch_Back Phone marketed by Virgin Mobile. Both hidden-keyboard phones are identical except for the addition of Bluetooth wireless technology to the newer Strobe K612B model. 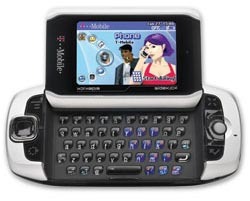 Still one of the most popular phones the T-Mobile Sidekick II is one of the best known of all keyboard cell phones. Made popular by celebrities in entertainment and sports, the current Sidekick II is 25 percent slimmer than its predecessor and is enhanced with the addition of a digital camera and improved battery. A unique side-hinge opens to reveal a full-color screen and backlit keyboard for email and instant messaging services from Yahoo! and AOL. 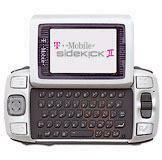 The Sidekick II provides high-speed data for fast uploads and downloads, and BlackBerry-like "push" email capability. T-Mobile has partnered with trendsetting Juicy Couture and renowned urban artist Mister Cartoon to create two limited-edition versions of the Sidekick II keyboard cell phone. Juicy Couture designed its signature T-Mobile Sidekick II keeping in line with the fun yet glamorous personality of the brand. The device is in Juicy crystal pink and boasts the easily recognizable icons decorating the trim of the screen. Custom-designed to reflect his style, Mister Cartoon crafted a sleek black ink-colored device featuring his signature tattoo design around the 2.6 inch screen. Also notable is the Sidekick's popularity with hearing-impaired consumers. For example, text-based TRS (telecommunications relay service) calling via the Internet, often called IP relay, is available to deaf callers using T-Mobile's Sidekick II. Services like i711 Wireless or Sorenson IP Relay allow deaf and hard-of-hearing individuals to place free text-to-speech relay calls from their Sidekick to any standard telephone user in the U.S.